This image of galaxy W2246-0526 was created using data from the Atacama Large Millimeter/submillimeter Array (ALMA) - a collection of individual radio antennas that work together as a single telescope. The galaxy is syphoning material away from three companion galaxies through trans-galactic streamers. The main galaxy and one of its companions are in the center. 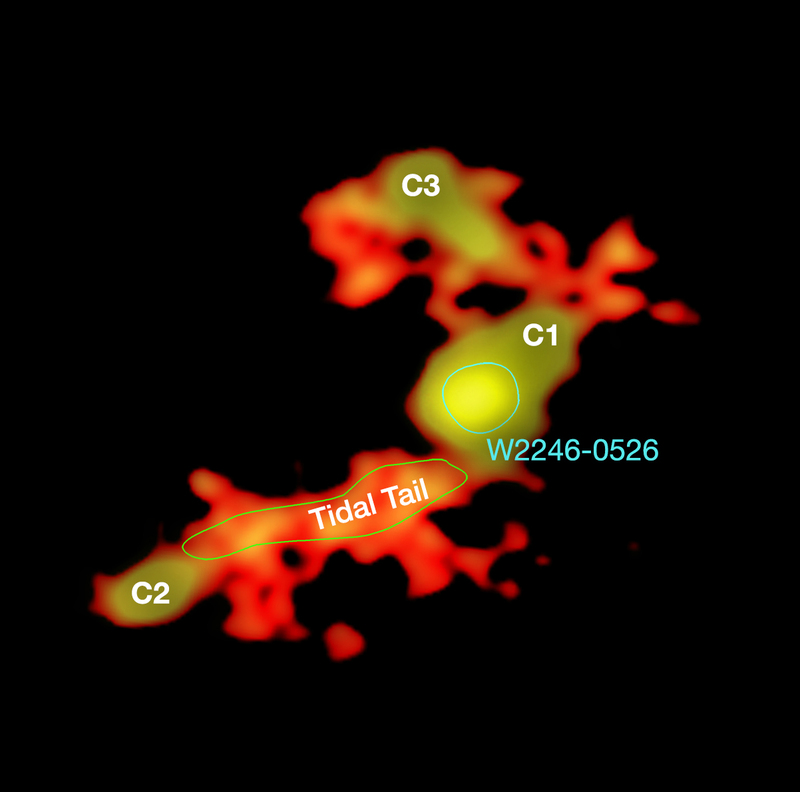 To the lower left is another companion and its large tidal tail that connects it to the main galaxy. The upper left concentration is the third companion galaxy. An annotated image (Figure 1), from the Atacama Large Millimeter/submillimeter Array (ALMA), shows how W2246-0526 is being fed by three companion galaxies (C1, C2, and C3) through trans-galactic streamers: a large tidal tail (labelled) connects C2 with the main galaxy; the other two galaxies (C1 and C3) are connected to W2246-0526 by dust bridges. ALMA, an international astronomy facility, is a partnership of Europe, North America and East Asia in cooperation with the Republic of Chile. ALMA construction and operations are led on behalf of Europe by European Southern Observatory, on behalf of North America by the National Radio Astronomy Observatory (NRAO), and on behalf of East Asia by the National Astronomical Observatory of Japan (NAOJ). The Joint ALMA Observatory (JAO) provides the unified leadership and management of the construction, commissioning and operation of ALMA.